Kieran J & X-Moon are two up and coming producers who hail from Killarney, Ireland. Kieran's production debut came in April of 2009 on the Italian label PyCairo. Another single and remix followed shortly after before Kieran saw an original and a remix released by the excellent Israeli label Asymmetric. Kieran has a deep and edgy sound that that draws on influences from several genres. X-Moon was born is Albufeira, Portugal but has since relocated to Ireland. He has been DJing since the late 1990s and has performed with an impressive list of international talent that includes: Richie Hawtin, Sven Vath and James Holden. 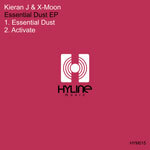 The 'Essential Dust EP' is the 15th release on Carsten Million's Hyline Music imprint and it sees Kieran and X-Moon together for their first collaboration. 'Essential Dust' kicks things off with a magnificent immersed groove that deeply roots the tracks framework. The effortless, glassy atmospherics combined with exceptional vocal elements create a late night hypnotic vibe that is rich with character and undeniable fortitude. The rolling, contagious energy builds in intensity over the course of the track and will leave your dancefloor wanting more. 'Activate' takes on a slightly more classic prog house approach with it's awesome drive and hooky synths. The hypnotic elements and intense atmosphere keep it firmly rooted in today's modern landscape. Shimmering chords fade into the mix and escalate in potency during the drop before a massive climax brings on the thundering groove that should provide a classic hands in the air dancefloor moment.